You may have noticed that Dixons have reduced the price of the Advent Vega to £199. If not they have and here is the link. I bought one recently and I thought I would share my initial thoughts about the device to try and help potential buyers make up there minds. Dixons are selling the non flash models at £199. This sounds like a problem but it is not. www.myadventvega.co.uk has an official firmware update which updates the device and includes a flash player. Once you have sorted this out the Vega can play flash video from websites. You can copy music and videos to it, which playback well, you can also use the hdmi connector to connect the Vega to your tv. App wise the Vega barely comes with any. Just basic email, file management, web browser and a few tools. You can install an alternatve market like Appslib or Appbrain but they are not the best. A major problem with the stock software is the small amount of space to install apps on, it is not as bad as some devices like the Htc Desire but you still don’t get much space. Another problem is the screen, from certain angles and orientations you can struggle to see what is on the screen. In sunlight you struggle to see the screen properly. The screen is a major fingerprint magnet. Lastly the accelerometer is not sensitive enough to play the latest driving games. With a little bit of reading and preparation you can easily install a Modaco Custom Rom, this installs various performance tweaks, all of the mising Google apps, the Google Market and a handy program called Link2sd. This allows you to bypass the internal memory and move most of your games and apps from the market across to your memory card. I have created a 2GB partition for installing things onto which should last me a while. 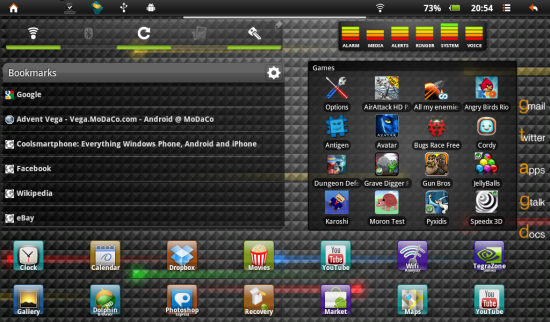 Below are some shots of the homescreen, the app drawer and info on the memory usage. After installing the Modaco Custom Rom the device is rooted, it feels more stable, it feels faster and the screen is more responsive. There is a great community behind the device already creating custom kernels and roms, even Cyanogenmod 7 has been ported to the device. As regards further official updates Advent have not yet announced whether or not the device will get Honeycomb. But for the money it is a great device, for web browsing, or playing games, watching videos. As long as you have time to spend installing custom roms etc. So if you have any questions please ask away and I will try and do my best to answer. First answer is as follows. 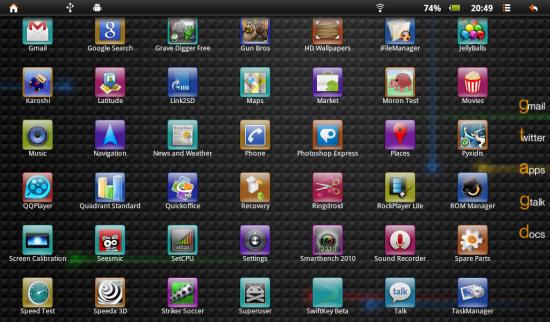 The screenshots show ADW EX, Colorize Widgets, Folder Organizer, Extended Controls & Audio Manager Pro.